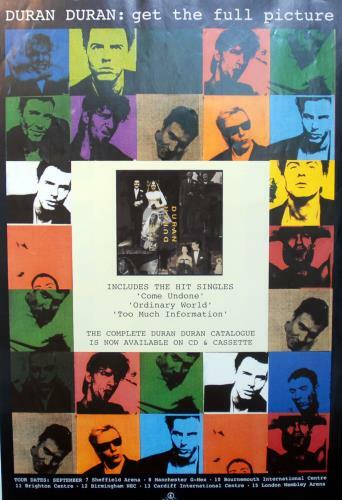 DURAN DURAN Get The Full Picture (Rare 1993 UK official Parlophone promotional-only instore display poster for the Wedding Album with sleeve art designed by Eric Roinestad and Nick Egan - featuring a centralised cover art image surrounded by Warhol-style pictures of the band members, with UK tour dates at the bottom. This example is in superb condition, measuring 30" x 20" - ideal for framing & display!). or visit our Duran Duran image gallery.